The Blacklist has been shocking fans with big moves in recent weeks, but the NBC series is now getting ready for another big move – the backdoor pilot for its spin-off series. Famke Janssen is set to star on the spin-off if NBC decides to move forward with it, and she will appear on the May 5 episode of the series, which is the episode before the backdoor pilot. The episode is titled “Susan Hargrave,” which is the name of Janssen’s character. 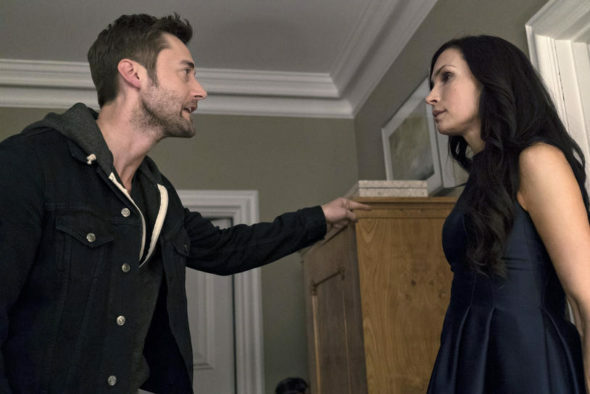 TV Guide shared two photos of Janssen as her character, and she is sharing a tense moment with Ryan Eggold. He will also star on the spin-off if it moves forward. 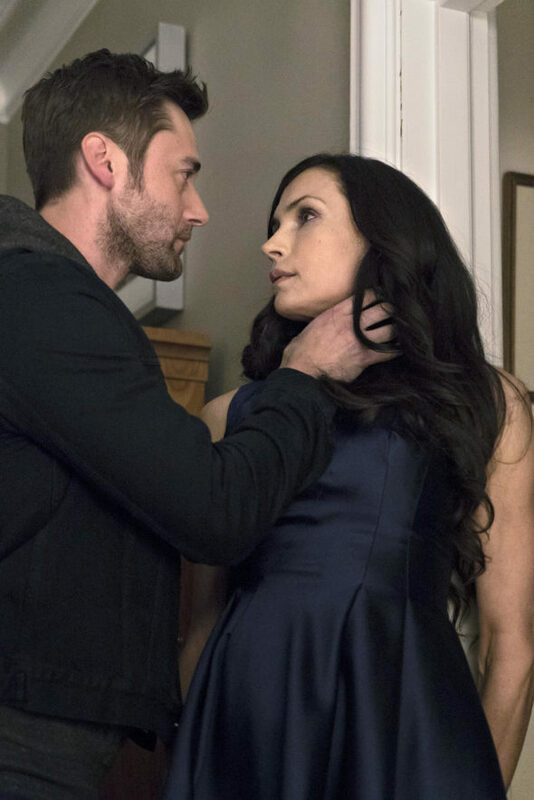 Check out another photo of Ryan Eggold and Famke Janssen below. Are you excited to see her on The Blacklist? Tell us what you think. The actors and actresses on the blacklist are amazing, but I have to say the story line is what keeps me coming back. I am fascinated by the writing. Is there list of writers of this intriguing series? I love Blacklist Redemption! Thurs episode was sooo good! Mr. Solomon is the coolest character on TV. Tom is the man on this show, not in Red’s shadow . Both shows can stand on its own. We love Blacklist with regular cast and guest stars! Spinoff is boring!!!! We miss Redington. He is awesome. Never seen an actor memorize so much material. He is so talented! Missed the finale. Family graduation. Wonder if NBC will rerun it. Still think spin-off will be good. Crossovers will be great. Still having trouble believing Liz is dead. Don’t tell me, Hope it will be shown again. Can’t wait to see Season 4. Love the show!!!!!!!!!!!!!!!! Awesome writing. Dyin to see spin-off show. Any show with James Spader is a hit with me. And now, I love Ryan Eggold to – Yum!!! I read that Megan leaving was a surprise to the cast. It was a secret?? If that is true, then it sounds to me like she will NOT return ever. I did like her and her connection to the FBI. I also really like Jamke Jansson as the new character. A beautiful, strong character to match Red. I’m in shock!! What Liz dead! Give me a minute! OK , ok I love Tom so let him loose!! Who’s going to take care of the baby? I”m in, I”ll watch. Better be good!! No need for a spin off… Liz needs to come back after having faked her death, Red and Liz are what we watch it for! While I like the character, I could care less about a spinoff. There are plenty of shows to view that we could watch, I just so happen to like the original mix of characters on the one we had already. We will probably watch but would rather you tell us this is a mistake and Lizzy comes back. I’m not happy about a spinoff at all. The series was great as it was. What were the shows creators thinking? I predict the spinoff will not due well. You have ruined a great show!!! I love the show as it was originally. No changes please. Isn’t she a little young to play Tom’s mother? i can’t wait to see her. She is great. Loved her on Hemlock Grove. And Liz is not dead Mr. Kaplan gave her a drug to seem dead to get away from Red… You’ll see….. I sure hope you’re right! I keep waiting to see an episode where we learn she isn’t really dead….. After all, isn’t she the co-star of the show?